Moshe Cotel lives in solitude on the third floor of an apartment building on a cacophonous street in a city that never sleeps. Yet sounds of all variety are music to the ears of a composer, which is in effect what his own teacher had taught him. Moshe began his day sitting at his piano listening the sounds outside and inside himself, and turned them into rapturous music. His routine was always to leave the apartment when his composition session was complete, not only for exercise but to listen to all the sounds for possible inspiration. 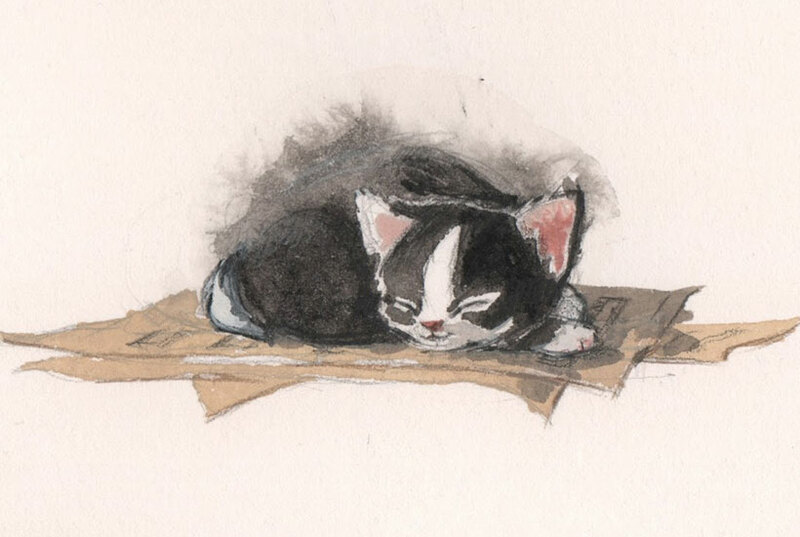 One day after hearing an unusual, more intimate sound Moshe came upon a black and white kitten nestled in a box around a corner. He named him Ketzel and took him back to his apartment, where he sat the small creature down on the top of the piano to witness his work in progress, sharing the advice that the teacher had given Moshe. Next up a few weeks later Moshe grooms Ketzel, dresses up in his finest suit and cabs over to the concert hall (the yellow cab and the circular configuration of the inside would seem to indicate we are in the Big Apple, and specifically at Carnegie Hall) where the piano solo was to debut. After two hours of non-stop music, a young girl emerge to announce she would be performing “Piece for Piano: Four Paws” by Ketzel, but is interrupted by a “meow” when the cat hears her name from inside Moshe’s vest pocket where she is hidden. Unfettered, the girl offers an encore of her intentions, but is greeted by another “Meow!” The audience by then were laughing aloud, and the house manager orders eviction for a forbidden pet. He is overruled by the judges who conclude there is no law against a cat who composes, and Ketzel is urged to stay on while the composition is played. The girl winds up playing the piece twice and Moshe with Ketzel ascends the stage to take the proper bows. The story and Ketzel’s photo make the newspapers worldwide, and the now famous feline is given a check for $19.72, which she “signs” with an inked paw at the bank. Plenty of cat food awaiting this extraordinary composer. The watercolor, gouache and pencil illustrations by Amy June Bates are exquisite throughout, but perhaps most significantly they tell what is an intimate story in the claws of an indifferent metropolis. The vignettes of Moshe and Ketzel are heartfelt, and there is a real personal and vocational camaraderie between man and cat, master and his apprentice, lonely creator and his muse. Bates wastes no time in setting the mise en scene with four extraordinary double page spreads. First up is front view of the steaming street, rife with overhead construction, hardhats, gridlocked cabs and barking dogs. The structures are sketch outlines, symbolic and impersonal, but there is warmth emanating from the composer’s red bricked abode, and yellow tinged tree blossoms. Then the composer-at-piano close-up with still life sunflower and onlooking bird, is sublimely rendered, even as a stand alone, and finally the striking overhead depicted bird’s nest over street sign, parking meter, trash can, and abandoned cat and litter box, a steaming terrain for Moshe to negotiate. Moshe is then pictured holding Ketzel full front, again with the outlined buildings and the ceaseless activity. After the set of irresistible bonding vignettes rendered in brown and mahogany, there is frustration and disarray in the spread showcasing the many failed attempts, and then the wonderful three-figure succession showcases of Ketzel scampering across the piano keys, surely one of Bates’ illustrative highlights. The upbeat, celebratory panels after the letter is received at the concert hall are affectionately etched, and the one with Moshe and his star composer in a back row is quite an example of diminishing watercolor perspective and abstract application. The two piano tapestries are wonderfully bathed in theatrical glow, and who can resist the newspaper stand with headlines of “Cool Cat,” “Purrfest Pianists,” “Cat Composer” and “Cat Composer”, the check or Ketzel having his paw inked at the bank. The final tapestry showcases famed feline in canned cat food bliss, while on the back wall a framed newspaper headline announces his feat to the world. Again Bates demonstrates depth of composition superbly. The duplicated end papers of Ketzel eyeing the piano keys and the gorgeous cream cover of a proud cat in front of his composition enhance this exquisite package. There have been a number of human and animal “teams” in the annals of children’s literature. In early 1996 Peggy Rathman’s Officer Buckle and Gloria won the Caldecott Medal for its narrative of a safety officer and his dog Gloria, both of whom performed their safety tips at schools. 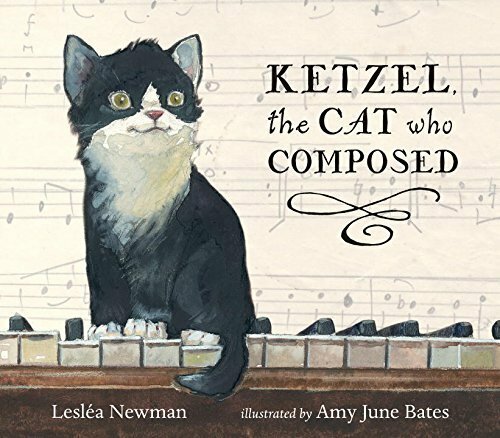 What makes Ketzel the Cat Who Composed so special is that it is based on a real-life event. The fact that it it is superbly and affectionately written and magnificently illustrated place in in the pantheon of essential children’s books. It should be a cinch for Caldecott committee scrutiny. Note: This is the twenty-sixth review in the 2015 Caldecott Contender series that will be published at this site over the coming months, up until the January 11th scheduled awards date. The books that will be examined are not necessarily ones that are bonafide contenders in the eyes of the voting committee, but rather the ones this writer feels should be. The order they will be presented is arbitrary as some of my absolute favorites will be presented near the end. One of your very best reviews Sam! Love reading about the way you came upon this title. Sounds like book contains great prose and equally great art. There is something special when you feel you have found something that has eluded most of the book lovers. But you did say it was on some best-of lists, so it isn’t buried by any means. You have written a delightful and typically comprehensive review, with some wonderful reference points. Yes, I’d have to agree that the real life aspect of this event makes it even more meaningful. From what I can see of the art it is lovely. Sam – Like Frank Gallo, I enjoyed reading about the serendipity (happy accident) involved with you finding this life-affirming book. The utterly delightful illustrations are delicious icing on the cake! Thank you for serving up another fantastic book! Laurie, it was wonderful to find a book of this quality, without having consciously searched for it upon entering the store. A real winner. Thanks so much for the very kind words my friend! You are still the reviewer extraordinaire, Sammy. This sounds beautiful. The illustrations very soft and distinctive. I’ll recommend this to my son who has a cat that loves no one only him! Thanks for those beautiful words Geraldine. Definitely a book work acquiring, as it is a keeper. Great way to frame the art my friend.